Effective planning and due diligence are crucial to the success of any project. Newark Metametrics’ experience and hands-on expertise allow us to foresee the practical implications of all the options and decisions to be made, avoiding unforeseen hurdles and making sure every aspect of your project goals becomes a reality. Our clients come to us early in the concept stage, relying on us to find the holes in the scope and budget of a planned project, and to flesh out a realistic timetable. We are experts at choosing which type of services and construction contracts are appropriate for your specific project and organizational needs, preparing RFPs that cover all the bases, and selecting the project team, builders and vendors that are right for you. We are also experts at evaluating design drawings to make sure nothing is left out, and all systems are coordinated to work with the plans. From technology to security, media systems and furnishings, we make sure the total package works together and that the owner knows how all aspects of the project are to be maintained over the life of the facility. When it comes time for construction and furnishings, we will be there to make sure all the hard planning is put in place just as intended, when it’s intended, and for the cost intended. We are a project management and design practice focused on enhancing the planning and implementation of projects for owners. At Metametrics, we work with our clients to create built environments that express the essence of their organizations. For each project, we seek to use our experience, capability and foresight to meet our clients’ objectives, both pragmatic and inspiring. Metametrics is process-driven and results-oriented: we understand that today’s organizations require comprehensive reporting, accountability and risk management, as well as vision and ingenuity in planning and achieving results. Newark Metametrics was founded in 1993 and we became an LLC in 2005. Tom Bish has been practicing architecture since 1976, and has a wide range of experience as a designer in small to mid-sized firms. Since 1986 he has also worked for a variety of brokerage houses as a designer and project manager of corporate interiors. Over the years Tom has designed and supervised the construction of food service facilities, data centers, branch offices, trading floors, print shops, mail rooms, public art installations and residential condominiums. His design and construction experience has allowed him to efficiently manage emergency and fast track assignments for clients as well as to economically phase and plan for large scale expansion. His involvement includes coordination between the client and their end-user, development of design and contract documents, the running of meetings, and the coordination and field supervision of construction. During all stages Tom ensures that the project satisfies the client’s internal requirements for approvals and reporting, LEED goals, branding, compliance and procurement. Recent projects include a phased consolidation in Boston of 54,000 s.f. of banking offices on three floors into 30,000 s.f. 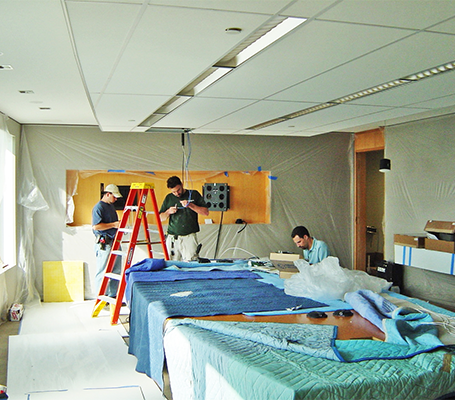 of densified work space; the relocation of the Toronto office of a major investment banking firm to 20,000 s.f. in a new building; and two new New Jersey branches for Citibank NA. Past experience includes a Crisis Management Center Control Room for a major bank’s New York campus; a Y2K Command Center for the same firm and a 25,000 full floor build-out in San Francisco for their investment banking division.